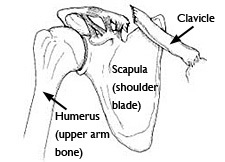 The collarbone (clavicle) is located between the ribcage (sternum) and the shoulder blade (scapula), and it connects the arm to the body. The clavicle lies above several important nerves and blood vessels. However, these vital structures are rarely injured when the clavicle breaks, even though the bone ends can shift when they are fractured. The clavicle is a long bone and most breaks occur in the middle of it. Occasionally, the bone will break where it attaches at the ribcage or shoulder blade. A broken collarbone is also known as a clavicle fracture. This is a very common fracture that occurs in people of all ages. Your doctor will carefully examine your shoulder to make sure that no nerves or blood vessels were damaged. Pins are also used to hold the fracture in good position after the bone ends have been put back in place. The incisions for pin placement are usually smaller than those used for plates. Pins often irritate the skin where they have been inserted and are usually removed once the fracture has healed. Specific exercises will help restore movement and strengthen your shoulder. Your doctor may provide you with a home therapy plan or suggest that you work with a physical therapist. Whether your treatment involves surgery or not, it can take several months for your collarbone to heal. It may take longer in diabetics or people who smoke or chew tobacco. Most people return to regular activities within 3 months of their injury. Your doctor will tell you when your injury is stable enough to do so. Returning to regular activities or lifting with your arm before your doctor advises may cause your fracture fragments to move or your hardware to break. This may require you to start your treatment from the beginning. Once your fracture has completely healed, you can safely return to sports activities.